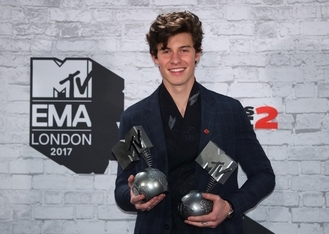 The Canadian star won awards for best artist and biggest fans and he also performed There's Nothing Holdin' Me Back, which was named best song. The event was held in London's SSE Arena at Wembley on Sunday (12 November) only for the second time and was hosted by the British singer Rita Ora, who performed her new single Anywhere. The evening was opened by US rapper Eminem, with a duet with Skylar Grey on the song Walk on Water. After getting the honour for Best Hip Hop, he said: "I'm not really sure how I got this, because I haven't had an album out in a few years". Talk of the night were London grime star Stormzy, who appeared on stage poking out of the sunroof of a police car, and Travis Scott, who appeared while standing on what looked like a floating hawk. Irish rockers U2 got a global icon award and footage of their concert recorded the previous evening in London's Trafalgar Square, was played. The two-hour ceremony, which was conducted under tight security, ended on a poignant note with a flashback to George Michael's performance of 'Freedom '90' at the first EMAs in honour of the great star who died this year.